A special post from my first guest blogger ever: Maya Rodgers. Hooray! While flea collars, medications, repellants, and ointments are convenient and helpful in warding off fleas, they can be hazardous to your pet’s health – and sometimes even deadly. Signs of poisoning include vomiting, shivering, dilated pupils, tremors, and skin problems. Worse still is that many of the ingredients found in flea medications are harmful to children and adults. (I have, in fact, given my dog spot flea and tick treatments, but the warning label on these medications can be daunting!) Luckily, there are natural alternatives for flea prevention that will hopefully leave you and your furry friends both happy and healthy. 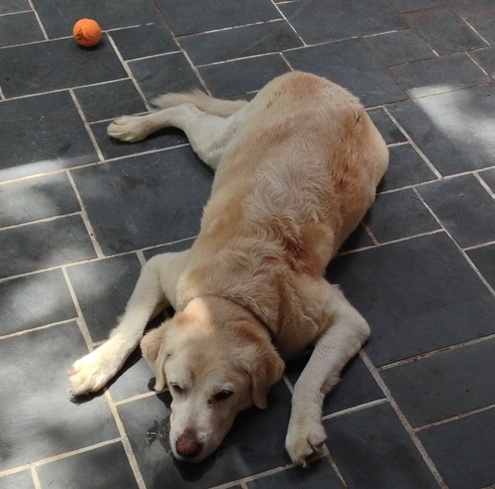 Guest blogger's dog, Mindy, tuckered out. Apple cider vinegar is full of healthy vitamins, nutrients, and minerals that are good for your pet. When used as a flea remedy, it can make your pet’s skin more acidic, which fleas hate. You can rub a small amount of ACV onto your pet’s skin, or dilute it with water, before spraying it on your pet. You can also bathe your pet in a solution with ACV, soap, and water. If your pet absolutely won’t bathe, use a flea comb, dipping the comb after each stroke into a bowl of warm, soapy, ACV water. If your pet can tolerate the acidic taste, try adding a small amount of ACV to your pet’s water bowl. Fleas are naturally repelled by lavender and other essential oils, so a homemade spray would be a smart choice when used as a flea repellant. BUT lavender and some other essential oils are hazardous to cats, so make sure you pick essential oils that are cat-friendly. Here’s a great resource on how to make your own essential oil spray. Your pet is more able to fight fleas when he or she consumes a healthy diet. Since most commercially processed pet foods lack certain vital nutrients, your pet may not be able to build up the natural immunities needed to ward off fleas. Adding natural ingredients like brewer’s yeast, garlic, flaxseed oil, and B vitamins to your pet's diet can aide in making them less tasty for fleas while boosting their immune system. However, before you add any supplement to your pet’s diet, be sure to talk with your vet about specific nutrients and amounts that are appropriate for your unique pet. Diatomaceous earth is known for its ability to kill off many different insects. Diatomaceous earth can be sprinkled onto your pet's coat, your yard, and onto carpeted surfaces to fight off fleas, BUT be sure to get food grade diatomaceous earth. This way if you or your pet ends up eating some, it won’t harm anyone. Let the diatomaceous earth sit on the carpet for 24 hours before vacuuming it up. Diatomaceous earth will likely need to be reapplied more than once before all the fleas are killed. If fleas have progressed out of your home to your yard, or came from your yard in the first place, buy a container of beneficial nematodes from a garden supply store. There are many different types of nematodes (some of which can harm your garden, so be careful! ), but the beneficial kinds can take care of many pests, including fleas. A last word of warning: Do not use nematodes and diatomaceous earth at the same time in your yard as the diatomaceous earth will likely harm the nematodes. Armed with these five natural remedies, any flea will cower at the very sight, smell or sound of your pet. Or at least I hope they will! Though these natural remedies should help get rid of fleas, you may need to use them more than once, and it’s up to you to make sure the fleas never come back. Continue to make sure that your pet is healthy, both on the inside and out. Keep bathing and combing your pet regularly, and vacuum often. Lastly, if you’re ever worried that the fleas might return, you can always sprinkle another round or two of diatomaceous earth. Maya Rodgers writes about pets, exercise, green living, pest control, and many other subjects on her blog: Pets and Pests. She gets her expertise on pest related topics from doing termite inspections and other pest-related issues for Terminix. She loves hearing from readers, so please drop her a line! Consider supporting this blog by clicking on an ad, shopping via my Amazon shop, or my Mountain Rose Herbs affiliate link. Thanks.